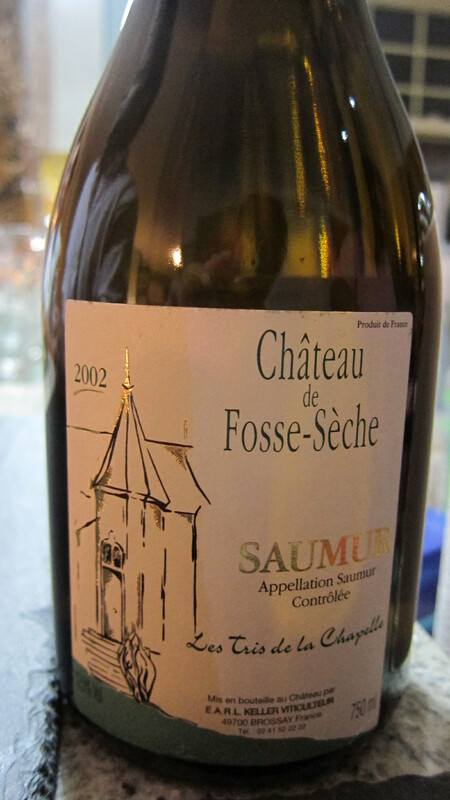 Phil, knowing my love of older white wines, sold me on the 2002 Château de Fosse-Sèche Saumur Chenin Blanc. I was expecting great things but was, unfortunately, underwhelmed. Rather than having pure honeyed notes, the Fosse-Sèche tasted a bit like stones washed with acid. The acid was so high as to be bitter. It did have some of the nutty quality that I love, but it was not part of a cohesive, beautiful whole. The wine improved with some time, but overall it was disappointing. 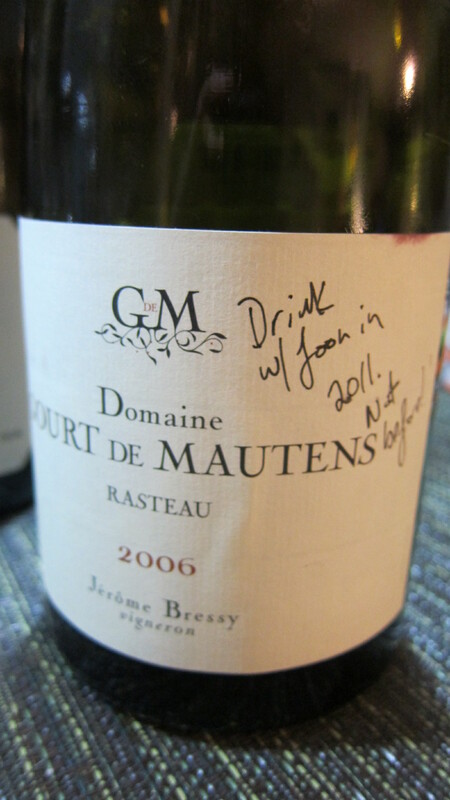 The Gourt de Mautens was a special wine. I had given it to Rahul as a birthday present in 2010, but subject to one condition: that they drink it with me in 2011. Selfish, I know, but what is wine without good friends, eh? Thank you to Kate and Rahul for having the discipline to honor this condition! We opened both wines but drank the Carco first. The Carco is a Corsican wine from the Patrimonio region, which was the first to receive AOC status, in 1968. I am not well-versed in Corsican wines, but they are supposed to be terrific values and feature some unusual varietals. The Carco was not an unusual varietal–it is made of Sangiovese–but it was a terrific value. **** It had nice light acidity and bright red fruit, sort of like you would imagine a Sangiovese to taste like if it were grown on a Mediterranean island. By this point I was salivating for the Gourt de Mautens, which is mostly low-yield Grenache and comes from very old vines. I’ve had a few glasses of this now and then, and I had gotten hooked on its dark, tannic, nearly-Herzogian power. This bottle did not disappoint. I had a glass of it and could have no more because it was so concentrated and so intense. 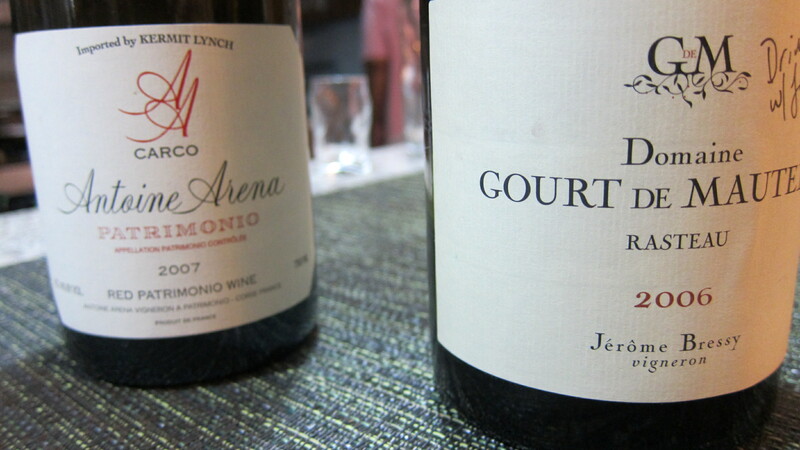 Normally, I prefer wines with greater acidity (like Chenin Blanc, or Sangiovese). My palate has turned away from high tannin blockbusters (like much Australian Shiraz). However, once in a while a big tannic wine ceases to be merely big or tannic and becomes something more: an experience, a big, brash woman who takes no quarter. The Gourt de Mautens is such a wine. Which did I prefer as between the Carco and the Gourt de Mautens? Hard question. I liked both of them equally but for different reasons. The Carco I could drink forever and drink with food, drink as an aperitif, drink just for the hell of it. The Gourt de Mautens requires you to gird your loins and steel your palate. Both, however, are extremely well made, and both serve their own purposes. 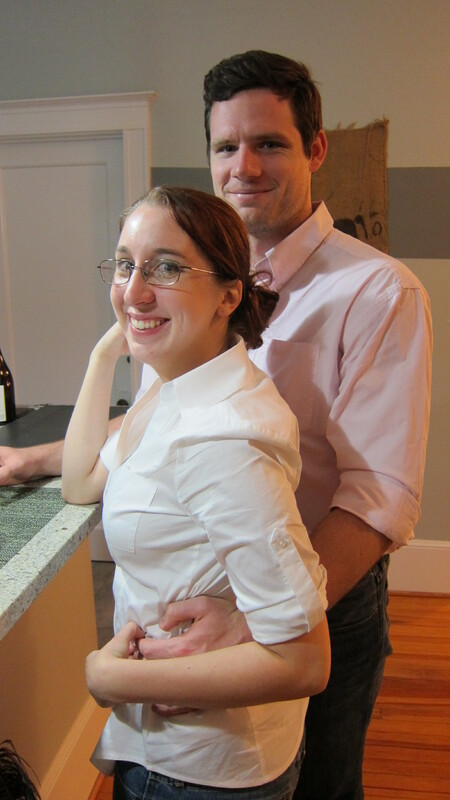 Having them together was a good reminder of why I love wine so much. * The wines of Bandol are a prime example of wines that, to me, should inspire a little bit of fear. ** Then again, I do enjoy some good gulping wines now and again. Beaujolais nouveau, chilled down, is a guilty pleasure, as is drinking red box wine with ice cubes as an accompaniment to Italian sausage and pepper sandwiches! *** Shea from Just Grapes declared a Chenin Blanc from the Loire one of his top 10 wines of 2009. But my Chenin Blanc love is not universal, and for good reason. Much of it can be insipid or bleh, as noted by David Fang of La Cave de Fang. **** The Carco is an example of a vin de soif, or “thirst-quenching wine.” Very appropriate. This would also be good chilled down and eaten with things like bruschetta, summer pastas, or grilled fish.